16th December again proved to be a dream killer. 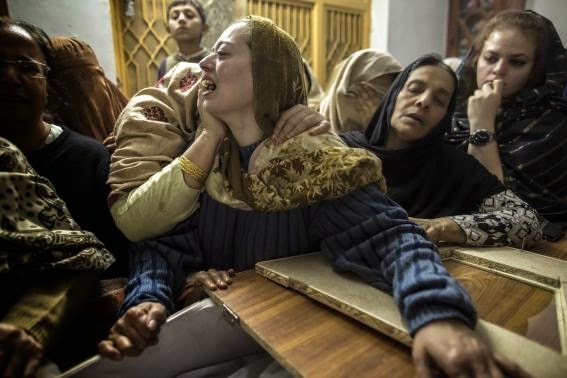 It killed the dream of a young lady in 2012 in New Delhi, India and now it has killed dreams of those parents whose children were shot dead by Taliban terrorists in Peshawar Pakistan. 132 children and 9 staff members were killed by 7 Taliban gunmen in an Army School of Peshawar. Their parents would have weaved thousands of dreams with them for them which now have been buried with them. The date with yesterday's incident again marked a black day for humanity. They so called believer of Islam have forgotten that Islam labels killing of an innocent equivalent to killing of mankind. These terrorists were so coward that they targeted small children for what they called revenge from the armed forces of Pakistan. The images of small children soaked in blood coming out from the wounds of bullet shots or those covered in shrouds were heart wrenching. I don't know what made them think that they will reach heaven by such brutal massacre. How a normal human being can think of hurting children in such a way. Pakistan has paid a heavy price with this incident to learn 'we must reap what we sow'. For years Pakistan is a heaven for these terrorists groups of hardliners who are the threat for world peace. These groups are time and again have also proved dangerous for Pakistan itself but no firm steps have been taken against them. This attack on children was to thwart the forward march of Malala Yosoufzai's who have won noble peace prize 2014 for her work on children education. This prize in a way was a defeat for Taliban who once shot her for going to school. It was their annoyance at her commendable progress in this area. Islam give equality to women in education,business, military and other such fields and in no way restricts them to have knowledge. Prophet Muhammad's first wife was a businesswomen herself. So, those restricting these girls in name of Islam are tarnishing its image. Not only Islam but no other religion in the world allow such cruelty to innocent children. These spineless worshipers of terror are only hiding behind the veil of religion to fulfill their own dirty desires. I pray to Allah for patience to families for all those children and teachers who have lost their lives in Peshawar attack. But it's a very good sign that the world stood united for such shameless and cruel act of violence towards humanity and spoke in one voice against it. shameful is ach a hollow word for it... de-humanising and demonic .. It's so depressing and antagonizing for such cowards to kill small children. Such cowards and terrorists cannot belong to a religion and has no right to call themselves religious or believers for no religion condone such heinous act. I am saddened by the fact that in-spite of getting support from India in this matter Pakistan still released the mastermind of Mumbai attack. I am sorry to note that the state that support terrorism, suffer like this. Every time I think of those innocent children I shudder in fear and think - RIP Humanity.